If you own a dog, there are so many reasons to ensure that they should get regular walks. Not only is it good for the dog, but it can also be good for you! Ideally, your pooch will get walked every day to give them the exercise and stimulation they need. If you can at least walk them several days a week, you will begin to experience better health, a better sense of well-being and a better relationship with your dog. In the process of relieving both your own stress and your dog’s, you also make your home a more relaxing place to come back to. 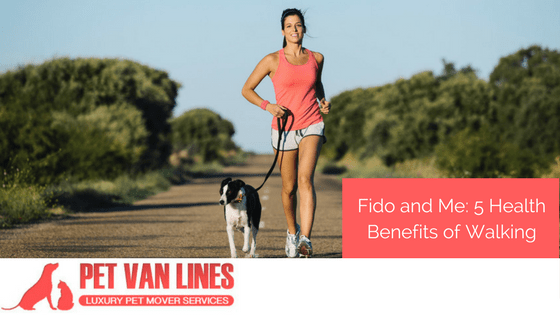 Learn more about why you should walk your dog regularly, and how it can help with things like moving with your pet. One of the biggest barriers to exercising for most people is that it cannot hold their interest. Sticking to a routine of regular jogs or weight lifting can get old, especially if the exercise itself does not ultimately feel that rewarding. Walking your dog serves a distinct purpose, so you are motivated to do it as a way to care for your pet, but it also happens to get you into a healthy routine that provides real benefits. Additionally, your pet enjoys it, which provides a tangible reward to encourage you to get moving. People who walk their dogs walk 22 more minutes than the typical population, on average, according to NPR. These short trips add up to substantial benefits for your body even though they are light intensity. Studies show that those who walk their dogs regularly have a lower risk of diabetes, and are less likely to have high levels of LDL “bad” cholesterol or high blood pressure. With a regular dog walking habit, you can boost your chances of having a longer, healthier life free from chronic disease. Dogs, especially working breeds, absolutely require the stimulation that walks provide. They get some light exercise, but they also get to see and smell the area around them. By the end of the walk, they are not only more tired and relaxed, but they feel satisfied after having experienced things beyond their home’s four walls. This stimulation can greatly reduce behavioral problems in dogs, especially destructive boredom like chewing, scratching or tearing up furniture. Your dog will be less likely to seek attention from you through barking or whining, and it will also reduce their chances of acting anxious or aggressive. They are also much less likely to go to the bathroom indoors, sparing you from having to clean up an unpleasant doggie mess. While not having the stress of a badly behaved dog would seem like a reward unto itself, you also obtain your own psychological benefits while on walks. According to Psychology Today, dog walkers feel less anxious, less lonely and have a stronger sense of community when they walk around their neighborhood regularly. Medical supplies and medicines bought from vet offices cost pet owners an estimated $15 billion last year, according to CBS News. Many of these expenses are the result of chronic conditions in pets that could be avoided or lessened with regular walks. Dogs that are walked regularly have a lower risk of obesity, arthritis, constipation, diabetes and lowered immune response in relation to high stress levels and unhappiness. Not every condition can be prevented through walking, but walking does lower your pet’s risk overall while raising their quality of life. Moving with your pet can be one of the most stressful times in both your life and your pet’s. Pets who are not walked regularly will have higher stress levels and respond worse to the stress of being moved, and they may have less strong of bonds with their owners, leading to compounding problems. On the other hand, a regularly walked dog is calmer, happier, less anxious and more trusting of their owner. Even with everyday walks, no pet wants to be boarded on a flight and given sedatives to help with transport. If you cannot drive your pet or take them with you in the passenger area, note that you have a second option. Door to door pet transportation services can bring your pets where they need to go overland, and they even get to stop and take walks along the way! Find out more about moving your pet when you request a free quote today.